You can now have access to our confirmation flashcards to help you study. The title at the top of this box (Confirmation Flashcards!) is a link that will direct you to a website called cram.com. 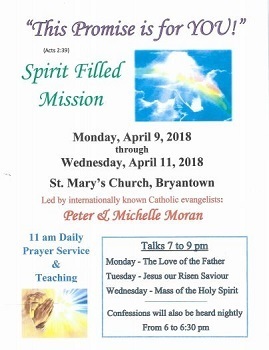 In order to find our flashcard set type confirmation flashcards- st mary&apos;s bryantown in the search box at the top of the cram.com page and you will see our set of 200 cards come up. Click on the title confirmation flashcards- St Mary&apos;s Bryantown and that will direct you to the cards. This is a great resource to help you study for you confirmation exam. Happy New Year From IGNITE Youth Group!! Please click on the title to read all about the exciting information and events IGNITE youth group has coming up! We also ask that you stop by our full page to see our past events and learn how to become a member of our fun and faith-filled youth group! HOW DO I SET UP ONLINE DONATIONS? We utilize web bill pay, set up through your individual bank for online donations at St. Mary&apos;s because there are no hidden costs or fees associated with giving for the donor or for the church. For more information on how to set up online donations through your bank please contact our Parish Accountant Lisa Shumaker by phone at 301-870-2220 Ext. 11 or by email at smbacct@comcast.net. Please join us this Sunday, November 4th from 12:00 p.m-5:00 p.m for our annual Fall Dinnerfest. The menu includes Fried Oysters, Steamed Shrimp, Fried Chicken, Ham and all of the fixings. Adults and all carry-out orders are $28.00. Children 6-11 are $10.00. (Children 5 and under are free) This is an all you can eat buffet style event. Come check out the Country Store, Raffle items, Silent Auction and Baked Goods Table. We hope to see you there! Check out IGNITE Youth Groups newly redone web page for information on how to become a member or upcoming events! You will find it under the Ministries page within our site. Spring is here! Join us for an “Afternoon Tea” sponsored by the HSA on Saturday, April 28, 2018 from 11 am-2 pm. Raffle tickets sold at the event to win lots of great prizes to include American Girl items as well as a Grand Prize Raffle item! Door prize giveaway to one lucky guest. Vote for your favorite table decorated by our SMB classes and table sponsors. Event is open to all ages, bring your friends and the whole family. $25 for adults and $15 for children 12 and under. Don’t miss your opportunity to attend this wonderful event! A big thank you to Capital Teas for donating tea for this event! Click on the heading for the flyer with more information on this fun event. Prayer group meets the 1st and 3rd Thursday every month from 6:30 p.m to 8:30 p.m. We hope to see you there! Please join us the 2nd and 4th Thursday of the month from 6:30 p.m to 8:30 p.m in the school hall. The Parish will be sponsoring a pilgrimage to Mother Seton Shrine in Emmitsburg on Saturday, April 28. We will leave at 8 A.M from the church and be back by 8 P.M. that night. Father Conley will be leading this pilgrimage to the Shrine of St. Elizabeth Ann Seton where we will offer mass, have a tour, and eat lunch. While in Emmitsburg we will also visit the Lourdes Grotto. On the way back from Emmitsburg we will stop at Springfield Manor Winery in Thurmont for a wine and cheese tasting. Thanks to the generosity of a benefactor and the Keller Bus Company, the cost of the trip is just $35.00 per person and includes lunch and the winery visit. For more information and to register contact Lauren Balderson at 301-870-2220 Ext. 11 or at smbassist@comcast.net. Payment is due at the time of registration. Checks should be made out to St. Mary&apos;s Church. We are looking for volunteers to help decorate the church for Easter mass on Saturday March 31. If you are interested, please meet in the sanctuary at 9:00 A.M. Hope to see you there! This is an inspiring and practical series aimed at people of all ages to help them encounter the Holy Spirit.